The recent marine expedition of RV Angra Pequena into the Comoros, which was made possible by Critical Ecosystems Partnership Fund (CEPF), saw the first visual mesophotic surveys conducted in the deeper habitats (the depth between 40m and 200m) of the waters around the Archipelago. These surveys were part of a 2-year project led by WILDOCEANS and implemented in collaboration with the South African Institute for Aquatic Biodiversity (SAIAB), Coastal Oceans Research and Development in the Indian Ocean (CORDIO), the University of Comoros, Comoros Directorate of Fisheries and Nekton/ University of Oxford. 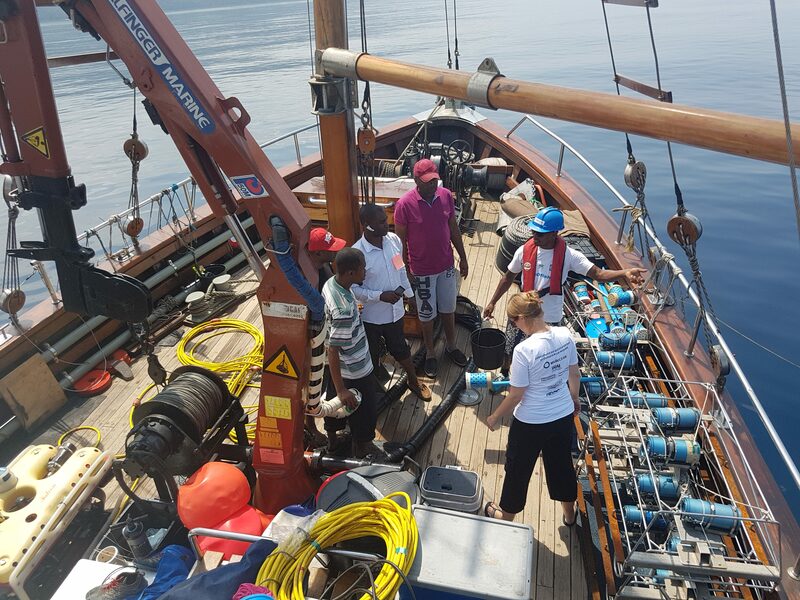 Scientists and students of the University of Comoros and Directorate of Fisheries joined the 20-day expedition aboard the 72ft research vessel. Surveys of biodiversity and fish communities were done using a Remotely Operated Vehicle (ROV) and Stereo Baited Remote Underwater Videos (SBRUV), equipment provided by the African Coelacanth Ecosystem Programme (ACEP) part of the research platform managed by SAIAB. Led by Chief Scientist Dr Melita Samoilys, Director of CORDIO, the team repeated shallow surveys around three islands (Anjouan, Grande Comore and Moheli) using scuba diving to compare the condition of the areas over time, and to understand the difference between the shallow habitats and the deeper habitats. Moving from the shallow reefs to explore the biodiversity of the deeper reefs by ROV, the team found a shift from the hard corals, which depend on their relationship with photosynthesising algae, to soft corals that do not have a symbiotic relationship with light dependent organisms. The deep reefs were richly covered by various species of sponges and soft corals, including large sea fans and black corals. In general, the conditions of the deep reef habitats at Grande Comore and Anjouan islands were good but the very low numbers of fish were striking. Fishermen who joined the team to observe the deployment of equipment and surveys in action, also expressed concern about fish numbers and declines over the past decade. In contrast to the habitats at depth, the shallow reefs on these two islands showed signs of severe degradation, most likely due to bleaching and possibly dynamite fishing. Disturbing was the huge amount of plastic and general trash seen on both shallow and deep reefs. A feature in Anjouan were plastic sacks used as anchors – which catch on the reefs and are left behind. The team were very encouraged when they arrived at the marine protected area at Moheli Island to find reefs in comparatively good condition. The shallow reefs had healthy, hard corals that appear to have escaped recent bleaching events that has impacted much of the Western Indian Ocean,” said WILDOCEANS Executive Director Dr Jean Harris. “On Moheli island, fish such as grouper, were relatively abundant compared to areas outside of the MPA indicating that the marine protected area is having a positive effect in protecting these long-lived resident species from overfishing”, said Director Dr Melita Samoilys. Highlights of the expedition were engagements between the expedition team members and members of key organisations in the Comoros. A delegation from the University of Comoros, led by the Dean of Science Achmet Said, welcomed the vessel on arrival and an introductory session was held at the University to discuss the aims of the project. The local NGO UMAMA hosted a community meeting in the Sima village on Anjouan Island and AIDE hosted similar meetings on Grande Comore and Moheli Islands. These were attended by the Mayors, fishers, fishery and conservation managers and tourism representatives. The purpose of the gatherings was to discuss the purpose and approach of the project, to share the first visuals of their deep marine environment, and to invite participation by local role-players. The project team also visited the Museum and Centre National de Documentation et de Recherche in Moroni and presented them with some samples and photographs from the surveys. The CEPF is a joint initiative of l’Agence Française de Développement, Conservation International, the European Union, the Global Environment Facility, the Government of Japan, the MacArthur Foundation and the World Bank. A fundamental goal is to ensure civil society is engaged in biodiversity conservation. “This project is an important contribution toward the collective efforts to protect the marine biodiversity of Comoros,” said Mhoumadi Soihibou, CEPF Representative in Comoros. “Research is expensive and technically demanding requiring the involvement of a range of stakeholders. The Comoros Expedition was an example of International agencies, Regional bodies, Government agencies, NGOs and host country communities (the fisherfolk) putting their combined expertise together to undertake science to better sustainably manage the ocean,” said Managing Director of SAIAB Dr Angus Paterson. Scientists and local community members in Comoros have been empowered and equipped to continue the work after the expedition. Students from the University of Comoros have been be trained to use various pieces of equipment, including the BRUV – some of which has been left with the team in Comoros to use for further research and exploration.